Father and sister stopped by for the night to help out with the big move. The more things we bring in to the new house the more I like it. I'm really in love with my room. 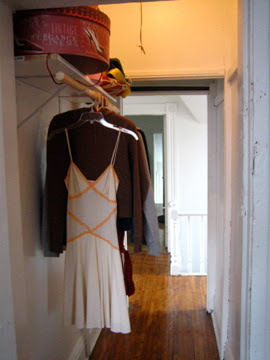 Plus I have a closet now, it's also my hallway. I find it harder to say goodbye to people. Even when I do it fast I seem to be affected by it later. I think we got rid of the hobo for good. 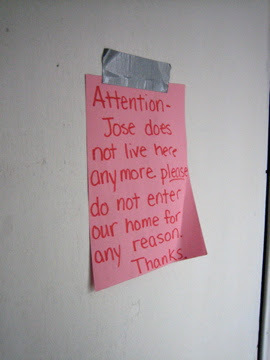 We were getting sick of all his friends stopping over at odd hours of the day so we made a sign. I think it's helped. I miss Scott a lot a lot a lot. IM so glad i didnt go, i got to collect bacteria from unsuspecting people and grew them, then i did archery, then, >this is life changing< we watched a movie on Henry Moore. I NOW UNDERSTAND MODERN ART!! !